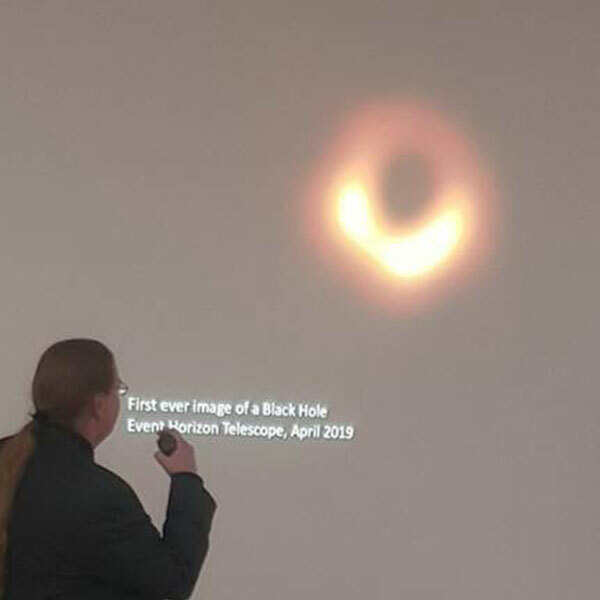 Professor Fabrice Laussy from the Faculty of Science & Engineering offers some insight into what a black hole is following the capture of the first image of a black hole by Astronomers, heralding a revolution in our understanding of the universe's most enigmatic objects. One of the most fascinating concepts formulated by Physics is that of a Black Hole. To understand why, it needs a bit of explaining what a black hole is. As the idea of something so massive that gravity lets nothing escape out of it, it reduces to a rather obvious curiosity, in fact already entertained by a clergyman in the decades following Newton's death. It was then thought that light consisted of corpuscles, hence subject to the newly discovered force of gravity. As the wave character of light came to predominate, the clever idea thus lost interest, but one interesting facet of Physics is that it is as difficult to be entirely wrong than it is to be entirely correct. Einstein later recognised that against all the compelling evidence of its wavelike character, light is, after all, made of particles (the 'photons'). Einstein's picture furthermore states that light is the straight line in the geometry of the universe, namely, spacetime. And this is what makes a black hole so peculiar: 1) the fact that the fabrics of the universe is spacetime, rather than space on the one hand waiting for things to happen as time passes on the other hand. And 2), that the equations (of general relativity) show that such a fabric can have holes in it. At a black hole, both space and time collapse. Try to imagine that there is no space and no time. That is what a black hole is. That the most obvious, almost the only tangible forms of physical reality that we experience get to vanish on paper from one equation is one thing: a delicacy for the intellect. That this gets to really happen out there is another entirely. Mind-boggling. At a black hole, where an infinite density of mass piles up at a single point, all our physical intuition vanishes. Supposedly, "remote regions" of space and time can thus be stitched together. Also, very beautiful optical effects take place, as one can imagine in a sink of spacetime where very fast moving objects evolve in a scenery where time dilates indefinitely and energy diverges. At the "event horizon", the famous point of no return, you can see the back of your head in front of you as light spins around the black hole. While science has been making us increasingly confident that this ultimate limit of—or to—the universe existed, nothing beats a direct observation in Physics, which is the door between dream and reality. And this just happened with the Event Horizon telescope collaboration. There now remains two major observations of things that science makes us confident exist but for which we still need a direct observation. One is extraterrestrial life. The other is new forms of intelligence. Interestingly, the sighting of Sagittarius A* (the black hole's name) is only partially direct. The object is so far that a telescope the size of the Earth had to be built to see it. The size could be matched by scattering optics around the Earth, from Spain to the South Pole passing by Hawaii, but only bits of a giant telescope is formed in this way. To reconstruct an image from such a tiny subset of a gigantic lens required an emerging technology: machine learning. In essence, artificial intelligence helped us "see" the most far-fetched concept that our own human intelligence could conceive. As we are tracking some of the most bizarre and wanted curiosities in the confines of the galaxy, we may be on our way to discover the even more ardently wanted others in the most unexpected place: our own pockets.